Superintendent R. Stephen Green, far left, and members of his leadership team appear at “On The Scene With Dr. Green” on Nov. 17, 2016. A waiver granted to the DeKalb County School District by the State Board of Education will give the District greater flexibility to improve and implement operational, financial and academic practices that support student achievement. 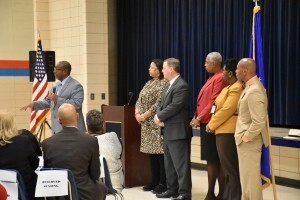 Under the state Strategic Waivers School Systems (SWSS) program, the DeKalb County School District will be granted flexibility from specific state laws over five years in exchange for generating higher levels of student achievement and operational effectiveness per agreed upon goals and measures. The contract is overseen by the Georgia Department of Education and the Governor’s Office of Student Achievement. The vision developed by the District for SWSS was developed over 18 months and based on feedback gathered at 17 community engagement sessions as well as extensive audits of academic and organizational practices. Click here to see the approved contract and supporting documents. With this new flexibility, DCSD will focus on improving six key areas: curriculum innovations, instructional delivery innovations, organizational innovations, human capital, operational innovations, and stakeholder engagement enhancement. Each impact area contains a series of sub-points that touch student achievement. For more information, please contact Laura Stowell, Director, Charter Schools, School Governance, & Flexibility, at laura_stowell@dekalbschoolsga.org or (678) 676-0718.